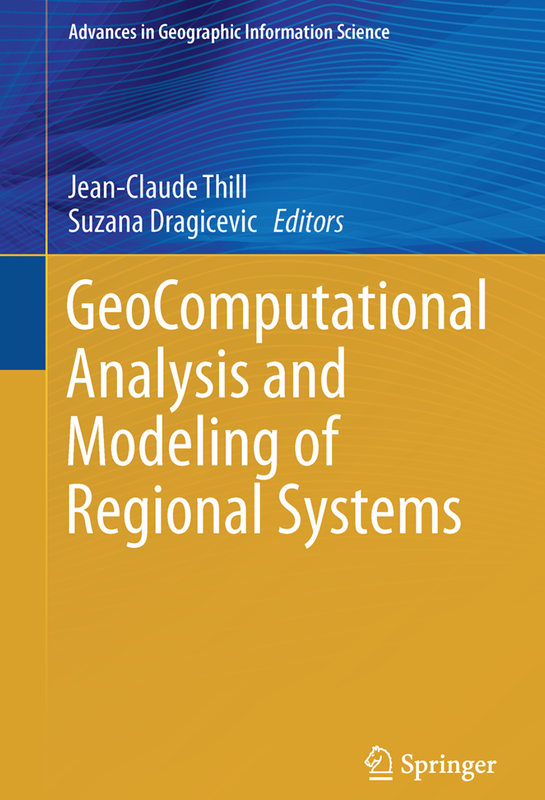 In the newly published book edited by Jean-Claude Thill and Suzana Drajicavic entitled: “Geocomputational Analysis and Modeling of Regional Systems” Amit Patel, Naoru Koizumi and myslef have a chapter which explores some of our work with respect to modeling slums in India. 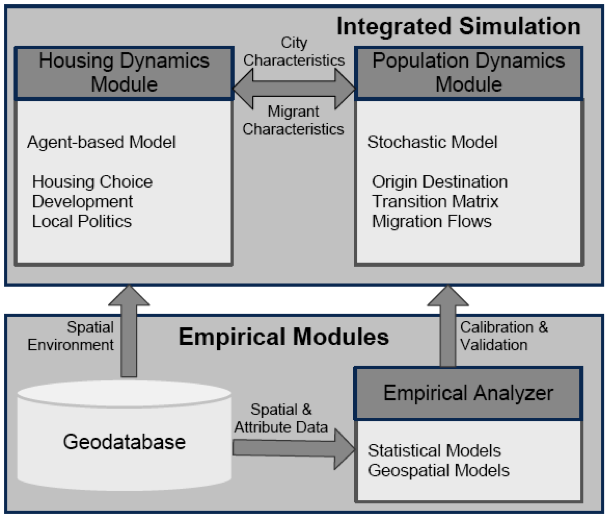 The chapter is titled: “Spatial Agent-based Modeling to Explore Slum Formation Dynamics in Ahmedabad, India.” In which we report some of the work we did with pertaining to our sponsored NSF Project: “An Integrated Simulation Framework to Explore Spatio-temporal Dynamics of Slum Formation in Ahmedabad, India“. Below you can see the abstract for the chapter along with some of the figures and a link to the project page. Recently I reviewed a great book entitled “Rethinking Global Land Use in an Urban Era” edited by Karen Seto and Anette Reenberg (2014) for the Journal of Regional Science. Readers can read my review below. The beginning of the 21st Century marked a milestone in human history. For the first time, more than half of the world’s population lived in urban areas (3.9 billion). This trend is expected to continue in the foreseeable future with 6.3 billion people living in cities by 2050 (United Nations, 2014). This growth will cause more urban land to be developed during the first 30 years of the 21st century than in all of human history (Angel et al., 2011). Combine this unprecedented urban expansion with global population growth, which is expected to grow from today’s 7.3 to 11.2 billion by 2100 (United Nations, 2015), and we are faced with unprecedented challenges and questions to be asked with respect to land-use in the 21st century. For example, how much living space will be needed to accommodate this growing population or how much land will be needed to feed such a population? Or how does urban growth in one country impact agricultural production and deforestation in the other parts of the world? To answer these questions, we need to understand the complexity of land competition from social, economic, and environmental perspectives at the local, national, and international levels and the connections between them. In their edited book, Rethinking Global Land Use in an Urban Era, Karen Seto and Anette Reenberg bring together 17 chapters from 50 experts from a variety of fields to explore global land dynamics in the 21st century. The first chapter acts as an introduction and scene-setting to the following chapters: it identifies current trends reshaping land-use locally and globally such as urbanization and the growing integration of economies and markets (e.g. telecoupling, see Seto et al., 2012), but also argues that there is a need to rethink land change science in a time when more and more people are living in cities. 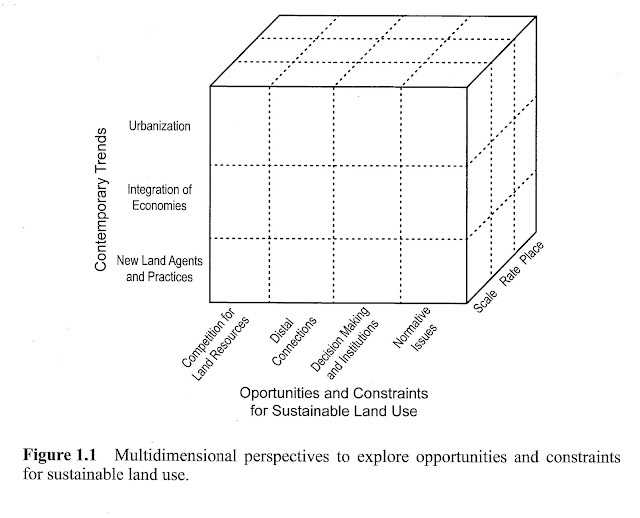 Specifically, they argue one should look at land-use through four lenses (which are the major sections in the book): land-use competition; distal land connections; decision making, governance, and institutions; and, finally, urbanization and land-use. The first section of the book focuses on land-use competition, specifically what types of land-use competition exist (such as forest vs. agricultural or urban vs. agriculture), and discusses how local land-use change is increasingly being caused by global factors (chapter 2). Chapter 3 addresses food security with respect to the growing population and discusses the need for intensification of production. Chapter 4 discusses the issue of finite land resources and competition for land—such as production vs. production (e.g. food vs. fuel) or production vs. conservation (e.g. food production vs. conservation). What is interesting about this chapter is that the competition for land is not just local but also global, due to the growing number of sovereign wealth funds and multi-national corporations and the increasing degree of interconnections between places. The section concludes with chapter 5, which offers an in-depth discussion of land-use competition between food production and urban expansion in China, specifically the effects of urbanization on the loss of cultivated land for food production. Source: Seto, K.C. and Reenberg, A. (eds.) 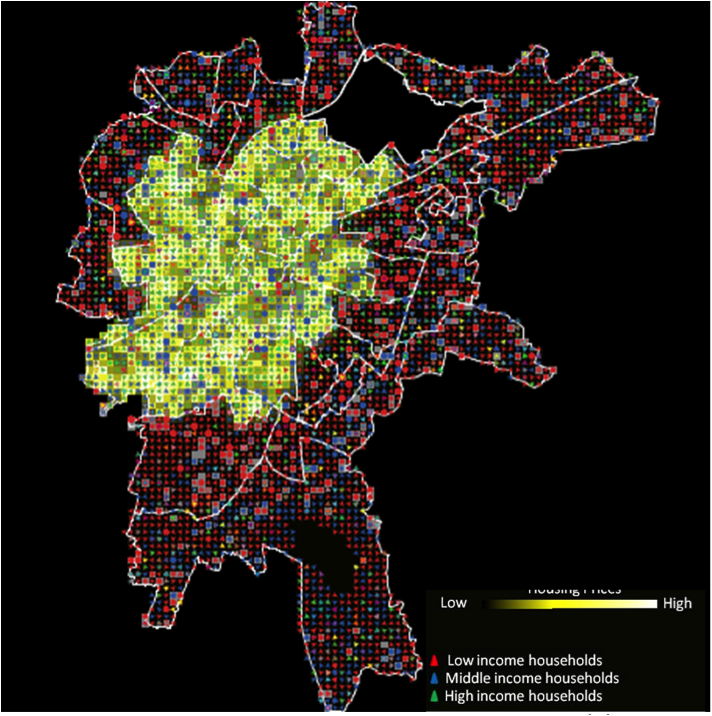 (2014), Rethinking Global Land Use in an Urban Era, MIT Press, Cambridge, MA. The second section of the book explores distal land connections. It opens with a chapter that reviews the globalization of economic flows and the impact of these forces on land-use transitions (i.e. land-use and land-cover change). Chapter 7 introduces applications based on the telecoupling framework to land-change science. It makes a compelling argument considering not just coupled human-environmental systems (where the focus is on local conditions) but also causes that emanate from distant locations to truly understand land-change. This theme continues in chapter 8, which outlines analytical approaches to study telecoupling, while chapter 9 uses palm oil as a case study of distal land connections. In essence, the consumers of palm oil live far from the source; thus many consumers do not immediately feel the impacts of palm oil production on land-use change. In the third section of the book, the focus is on decision-making, governance, and institutions. Chapter 10 discusses the emergence of global land governance as a result of land grabbing by foreign investors or governments (see GRAIN, 2008), which is prompting states and global civil society to devise new global land governance instruments, while chapter 11 explores large-scale land (grabbing) transactions with a specific emphasis on the actors and their interactions. Chapter 12 focuses on private market-based regulations (such as the Forest Stewardship Council) and what they mean for land-use governance at the local and international level. The final chapter in this section focuses on changes in land-use governance in an urban era. It discusses how governance mechanisms that manage land-use are changing from territorial organizations to global industries that are tied to specific resource flows between urban and rural areas. The final section of the book turns to urbanization and land-use. Chapter 14 reviews major contemporary urban patterns and processes related to urbanization, such as central place theory, and shows how advances in technology and infrastructure challenge such established theories. The next chapter discusses how urban land-use is unique in terms of form, size, and shape of cities and asks what will the future hold? Will cities be sprawling or compact? An interesting fact brought up in chapter 15 is that currently less than five percent of the earth’s surface is urban and with the urban population predicted to grow to 5 billion by 2030, the urban footprint will still be less than 10 percent (Seto et al., 2011). The final chapter in this section proposes a framework that moves away from looking at land as discrete categories but instead as a continuum with respect to sustainable development. The book concludes with a chapter written by the editors, which not only provides a summary of what was presented, but reemphasizes the interconnected nature of land-use and the need to study future global land change and urbanization from a multidisciplinary perspective. Overall this is a timely, relevant, and thought-provoking collection of papers which not only explores urbanization and food production using case studies from around the world as well as the connections between cities and distant places, but also lays the foundation for new ways of thinking about land-use sustainability in the coming decades. In my opinion, this book would be a great resource for scholars interested in current state of the art of land-use science and a good textbook for any course exploring land-use and land-cover change in the 21st century. Angel, Shlomo, Jason Parent, Daniel L. Civco, Alexander Blei, and David Potere. 2011. “The Dimensions of Global Urban Expansion: Estimates and Projections for All Countries, 2000–2050,” Progress in Planning, 75(2): 53-107. GRAIN. 2008. “Seized: The 2008 Landgrab for Food and Financial Security,” Available at http://bit.ly/28Nc7xK [Accessed on September, 7th, 2015]. Seto, Karen C., Michail Fragkias, Burak Güneralp, and Michael K. Reilly. 2011. 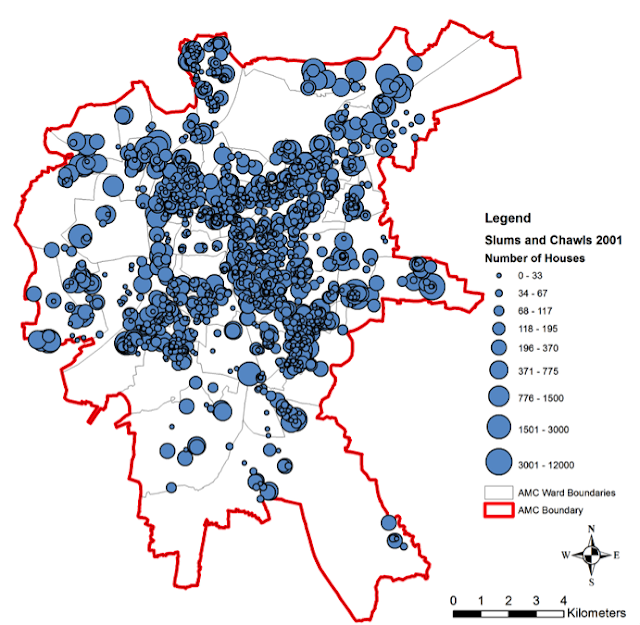 “A Meta-analysis of Global Urban Land Expansion,” PloS One, 6(8): e23777. Seto, Karen C., Anette Reenberg, Christopher G. Boone, Michail Fragkias, Dagmar Haase, Tobias Langanke, Peter Marcotullio, Darla K. Munroe, Branislav Olah, and David Simon. 2012. “Urban Land Teleconnections and Sustainability,” Proceedings of the National Academy of Sciences, 109(20): 7687-7692. United Nations. 2014. World Urbanization Prospects: The 2014 Revision, Department of Economic and Social Affairs, New York, NY. United Nations. 2015. World Urbanization Prospects: The 2015 Revision, Department of Economic and Social Affairs, New York, NY.